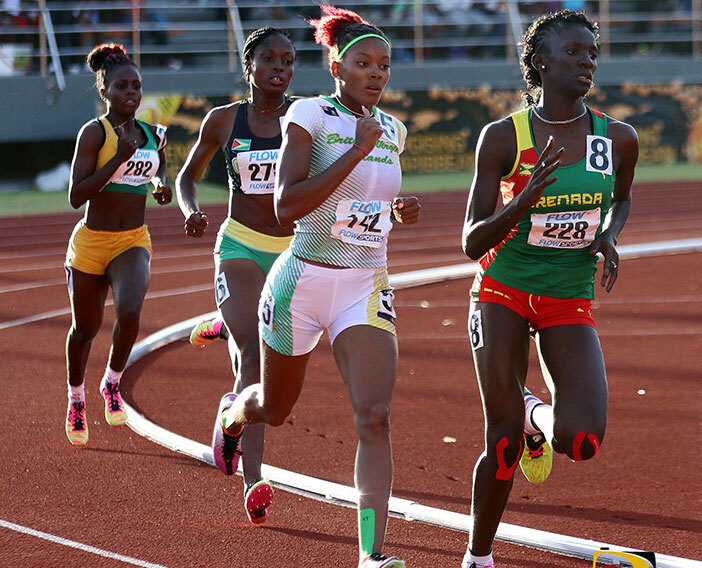 GEORGES, Grenada—Team BVI wrapped up the 45th Carifta Games in St. Georges, Grenada on Monday night with an U18 Girls 4x400m Relay bronze medal, after Lakeisha “Mimi” Warner and Tarika “Tinker Bell” Moses, grabbed individual silver medals in the 400m Hurdles and 800m respectively. 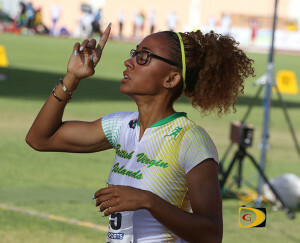 On Sunday, Warner split the Jamaican pair of Shannon Kalawan and Nicole Foster, to earn the silver medal in 58.14 seconds, solidifying her IAAF World Jr. Championships qualifying mark, which improves her own National Record. Kalawan ran 56.29 to break a 13-year old championships record. Moses won the BVI’s second silver medal on Monday afternoon in the U20 Girls 800m. In her first outdoor race of the season, Moses ran 2 minutes, 11.20 seconds behind Jamaica’s Junelle Broomfield’s 2:06.21, to end her Carifta career with a second individual silver medal along with an U17 Girls 400m silver, from 2013. The U18 Girls 4x400m Relay quartet of Judine Lacey, Zacharia Frett, Shaniyah Caul and Beyonce DeFreitas, bagged, a bronze medal behind Jamaica and the Bahamas, with a time of 3:47.43. With Caul in the lineup, it marked the first time a Virgin Gorda athlete would earn a Carifta Games medal. Competition began on Saturday with debutant Rikkoi Brathwaite and L’T’Sha Fahie, both finishing fourth respectively in the U18 Boys and U20 Girls 100m dashes. Brathwaite—just the second BVI male to make a 100m final since Derwin Scatliffe in 1987—narrowly missed a bronze medal by 0.03 seconds, finishing fourth in 10.69 seconds. He dropped his best from 10.92 a week ago at the Elmore Stoutt High School inter-house championships, to 10.88 in the prelims to advance. The U20 Girls 100m final was a historic one for the Virgin Islands as the BVI’s Nelda Huggins and Fahie along with USVI’s Nia Jack, all advanced to the final. Jack ran a personal best of 11.70 seconds-which qualified her for the IAAF World Jr. Championships later this year-to finish ahead of Huggins’ 11.80 as both advanced from the heat. Fahie rode a 3.2 meters per second wind and placed second in 11.71. DeFreitas, 15, just missed an U18 Girls 200m bronze medal when she lowered her day old personal best from 24.14 seconds to 23.97, the No. eight performance on the BVI’s All Time List. Winds robbed Fahie of a personal best in the U20 race, after placing seventh in 24.38. Debutant Djimon Gumbs had a heave of 16.20m to finish fifth in the Shot Put. He settled for a mark of 40.36m in the Discus Throw, the 11th best mark of the competition. Before winning 800m silver, and after a personal best of 53.72 seconds in the U20 Girls 400m preliminaries, Moses finished fifth in the final in 54.02. Judine Lacey won her U18 Girls 400m heat in 56.56 seconds, before leg troubles limited her effectiveness in the final where she ran 57.04 for eight. In the boys equivalent, debutant Rackeel Jack ran 49.57 to finish sixth, after advancing with 49.64 in fourth place. It marked the first time in the BVI’s 40-year Carifta Games history, that the territory had a finalist in all four male and female divisions of the 400m. Zacharia Frett was among those not advancing in the 200m after finishing her U18 Girls race in 25.14. K’cei Moses ran 22.45 for fourth in his U18 Boys race, while Todman’s 22.01 in the U20 Boys segment also did not make the finals cut.